On any given day, there are infinite number of distractions that can pull us away from what’s important – whether that’s writing our next post, promoting something new we posted on the blog, or getting ready to launch a new product. In those moments of distraction, we need something to propel us forward. And the best thing we can use? 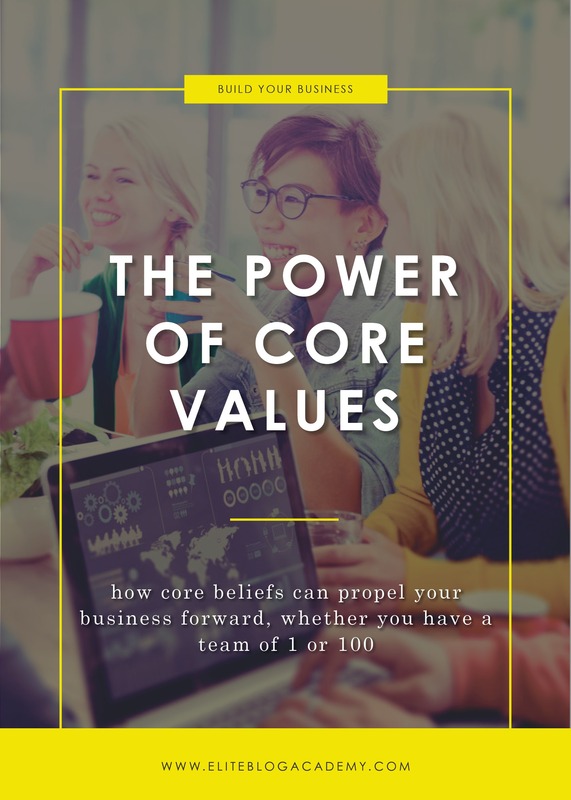 When we use our core values as a compass, we’ll always be moving our blogs and businesses – and our lives – in the direction we need to go. And, for our team, our core values are important in steering the direction of everything we do. For example, one of my company’s core values is “we don’t peddle fluff.” So everything we create — whether it’s a free blog post or a paid product or a podcast interview or a worksheet — has to deliver real value to our audience. Another value of my company is “grace under fire.” We have thousands of customers — and let me tell you, those customers keep our customer service team busy! It can be easy for people to get frustrated in customer service, but our team uses the “grace under fire” value to drive their interactions, and as a result, they are gracious and patient and amazing — something our customers really appreciate. Another example of a core value that really drives us is “we can change the world.” We truly believe that, through our products, we can change people’s lives. And that those people can change the world. YOU can change the world — especially when you use your core values to lead the way. We all need guideposts to keep us grounded and moving in the right direction. 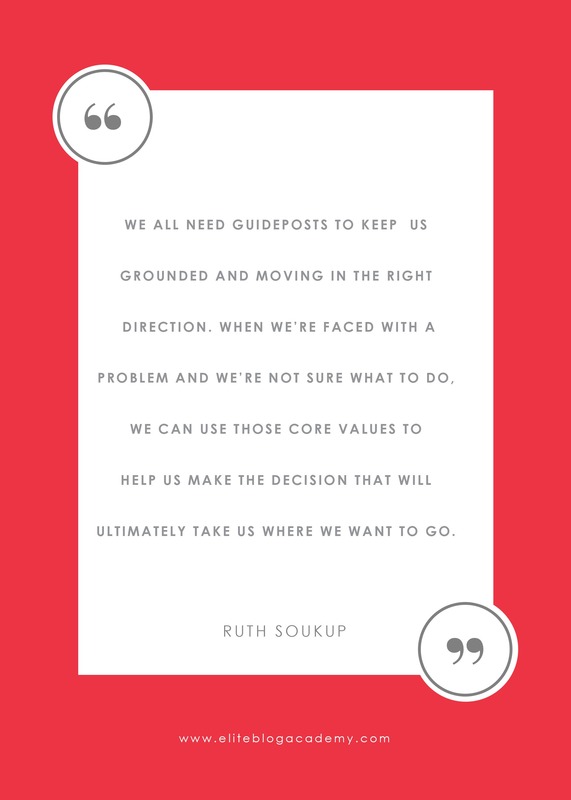 When we’re faced with a problem and we’re not sure what to do, we can use those core values to help us make the decision that will ultimately take us where we want to go. Now, obviously, our blogs are important. But for most of us, they’re not the most important thing — so it’s crucial to know which values come before our blog. For example, another value we have is “family first”. So many of our team are moms (myself included!). And sometimes, situations arise in which family obligations and blog obligations compete with each other. When that happens, it’s not even a question — family always, always comes first. This core value drives so much in our business. If we’re having a staff meeting and someone has to bring their child because the babysitter got sick, no big deal! In another business, that might not fly, but in our business — a business that values family above everything else — it’s a no-brainer. What are the things that are most important to — even more important than your blog? Is it spending time with your partner? Or making the time to exercise every morning? Whatever it is, make it a non-negotiable and always put it ahead of your business. It might seem counter-intuitive, but protecting the things that are most important to us and giving them the time and attention they — even if it takes time and attention away from our blogs — will actually help our businesses, not hurt them. Now that we know core values are essential to build the kind of businesses we’re proud to call our own, let’s talk about how to make that happen. There’s no magic formula to figuring out our core values, but there are definitely steps we can take to get the ball rolling. The first thing that’s helpful when defining our core values is looking for a bit of inspiration.Click To Tweet When I was starting to come up with my core values, I literally googled “company core values examples”. And there were so many results! 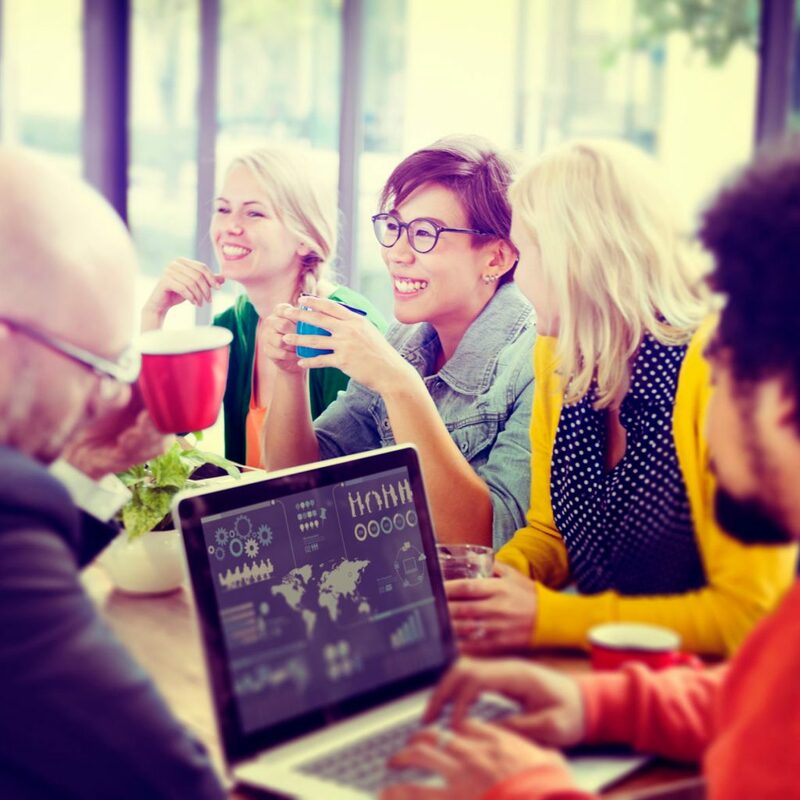 Seeing the core values other companies are use as a compass can help get the wheels turning and get us thinking about the values that feel meaningful to us. Courage doesn’t mean we are never scared; courage is being willing to take action despite our fear. Our character isn’t built by how we treat those who have everything to offer us, but by how we treat those from whom we have nothing to gain. If a problem can be solved in less than 10 minutes or for less than $100, we solve it, right then and there. Always, always, always be kind, because we never know what struggle someone else may be facing. Simply put, we will always strive to be the best in the things we undertake. We don’t peddle fluff; every blog post, every email, and every product that we sell must legitimately benefit our audience. We pay attention to the little things, and take extra care to always connect the dots so that nothing slips through the cracks. We believe a strong company and a strong family can and should coexist. We will not pursue success at the expense of our families. We believe that we have the power to effect positive change in lives of the people we serve through providing practical solutions for everyday overwhelm, and that those changed lives have the power to change the world. Once the idea wheel is turning in our heads, the best way to start defining our core values is by defining our most important value. What do we stand for above everything else? What is THE most important thing to us? If there was only one value we could live by, what would it be? When we know the value that’s the most important to us, we can use that as a jumping off point for defining the rest of our values. If you’re not sure what your most important value is, start by answering this question: “Above all else, we strive to…” We have two core values we consider the most important. The first is “do it scared.” Do it scared has not only become a motto for our team, but for our community, and pushing through fear is something we incorporate into everything we do. The other is “live what we teach.” We know we can’t help people eliminate overwhelm if we’re not actively working to eliminate overwhelm in our own lives. This core value reminds us to always practice what we preach, which helps us stay authentic. Decide the value (or values) that are most important to you. What do you stand for? Then use that value as a starting point to build the core values of your company. Now, some of us might not know just what our core values are. And that’s totally okay! Values don’t happen overnight. For us, it took a few years to really drill down on what our core values were as a company. And as we’ve grown and changed, our core values have grown and changed right along with us! So, if you’re struggling to define your core values, don’t sweat it. You don’t need to have the answers right this second. But even if you’re a one-person show, start thinking about what values you want to drive your business. There will be situations that leave you confused and cause you to question yourself, and if you don’t have an idea of your core values, you won’t have the compass to steer yourself in the right direction or hit your goals. Our core values make up who we are. They’re the heart of who we are as bloggers and as people, and they act as a compass, making sure we’re moving in the right direction — which is why it’s so important for us to define them. So what are your core values? What values drive you in your blog (and in your life)? Share in the comments below! We know we can’t help people eliminate overwhelm if we’re not actively working to eliminate overwhelm in our own lives. I am so resonating with this right now! I am in the middle of starting my own blog and I’d like to focus on being able to help people heal through traumatic events in their lives and my significant other has given me this inspiration as he is on his own healing journey and I know it would help his healing journey to be able to reach out to others and help them understand or get an idea of the emotions they go through and how their reactions are fueled by these emotions. I’d also like to put an emphasis on relationships because it’s so disheartening to me to hear that relationships fail because one or more partners has PTSD or anxiety and the relationship fails because something bad happens and they can’t, or won’t, work through it to help each other heal and learn from it. We’ve been together seven years now and it has not been easy but that does not stop me from loving him any less despite the actions, nor does it make me want to run away and let him deal with it on his own because what he’s doing to me sometimes isn’t fair. I also know that my reactions to his behavior doesn’t always help and it’s been a journey to both of us to learn how to handle things when times get too hard to focus on the here and now. We know that it’s not going to be a quick fix and our methods may not be 100% right but I think there is a serious disadvantage out there due to high medical costs and not being able to get the right treatment or not getting the understanding they need in their treatment programs. The blog will start out and maybe continue as a healing journey for me personally but I hope that my significant other will see how important the journey is and want to help in his own way but I will not just make him help me! I’m a beginning blogger too. Of the blogs I have chosen to follow, I’ve been so impressed by the kindness between bloggers, the sharing with readers and the online friendships. So nurturing friendships(3), within and outside of family, would have to be a one core value for me. Family(2) first is another. Recently, we learned my 3 yr old grand daughter has T1D. And I recently learned my health, my strength and endurance are almost non existent. How in the world could I help my grand daughter, my daughter, even myself in an emergency? The answer! I couldn’t! So self care(1) would have to be another core value. For me, my good health has to become the ground floor of my business. Sharing(5) is important. Whatever I learn by blogging, I want to share with others. Kindness(4) is another core value too? So to list these core values would be self care, family is next, nurturing friendships, being kindness, and lastly is sharing. I’m sure I can add to these core values in the future. I just launched my blog as well. It seems like a no brainer now but I hadnt even thought about what my core values might be or why that might be super important to think about, especially as a new blogger! Thank you for the post. This has been great food for thought.